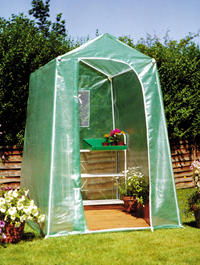 The E Z Grow portable greenhouse is the ideal safe solution for all sized gardens. 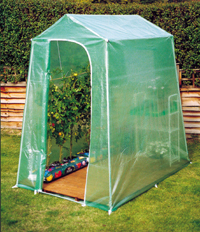 Whether it's for beginners or seasoned gardeners, who need that extra room. It's easy to assemble and packs away for easy storage. The frame is made from strong coated steel tube, the cover is made of a strong wearing Nylon reinforced plastic (U.V. stabilised). The door is double zipped to allow easy access and ventilation. The large rear window is fitted with insect net. Comes complete with storm kit comprising of additional ground pegs and guy ropes. A wooden floor can also be incorporated as an optional extra.